Monetize your traffic and start turning views into dollars. COMPLETE CONTROL OVER WHEN YOU ARE PAID AND HOW. You can request the amount for your pending payment before the scheduled payout date for a 3% fee. We believe people should be paid on time, every time. No exceptions. No excuses. Our payouts are automated to a bi-weekly schedule to ensure a consistent and reliable source of income. Decide how you would like your campaign payouts to be measured. We can pay out in terms of eCPM, CPI, CPA, CPC and more. 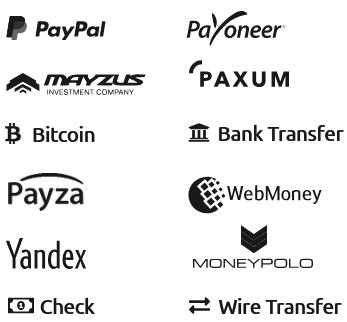 In addition to international an domestic wires, we also work with several partners in the industry (pictured below) to allow you to quickly and easily receive payments in your preferred currency. OUR HIGH PERFORMANCE PLATFORM DOES ALL THE HARD WORK FOR YOU. This is where our strong network partnerships take center stage. We are able to automatically allocate and assign inventory through our networks to keep things running as efficiently as possible. Adjust the target audience based on real-time performance. We work with a variety of partners in a wide-variety of industries. Gain control over what offers your audience will see by selecting which industry verticals you wish them to receive offers from. As soon as you have successfully registered with us you will be introduced to your dedicated account manager who will help you optimize your campaign and maximize your bi-weekly profits. Measure your campaign metrics in real time using our dashboard. This gives you deeper insight into which offers are performing best and allows you to tweak your campaign as needed to ensure the best performance possible. LEVERAGE OUR RESOURCES TO TAKE YOUR CAMPAIGN TO THE NEXT LEVEL. Every campaign you run will be monitored by a dedicated account manager who will make sure that your revenues are maximized. In an industry that is constantly evolving and changing, we are researching tomorrow's trends so you can benefit today. FRAUD PROTECTION KEEPS YOU (AND YOUR MONEY) SAFE. We offer a comprehensive, multi-layered fraud prevention to protect your campaigns and your ROI from harm. Security is of absolute importance to us and our platform reflects it. Sign up with your email address to receive news and updates from us on the latest industry news, trends and most importantly, strategies you can use to earn even more from your internet marketing business. © AdSurge. All rights reserved.